Up over 200,000 views! thanks again to all those that made this thread possible and to those who keep it going and adding information to it! ok, here it is. pretty much nine tenths of what you need to know to do a full aba swap into your A1. if you don't like to read GTFO now. 3. ABF bracket part#028 903 143 AD? option 1 only requires you to run down a VR6 water pump pulley or a VR6 power steering pump pulley and run a 1066 6pk belt. you can also run this option if you want to use your power steering. you simply run a much shorter belt for the P/S. i couldn't find or remember the size of said belt, sorry. MK3's use the same Sanden 508 style compressor as all diesel, cabby and rocco mk1's as well. a Chinese sanden 508 and a custom made bracket with a March serpentine conversion pulley. It's an aba compressor even though a g60 one is pictured in one of the shots. You move the compressor so the bottom compressor tabs mount on the top slot of the bracket. Cut the lower alt tabs off the bracket, make the alt and the compressor meet and run a bolt through them both. The rest is just an adapter block and new rubber lines w 134a fittings, mk1 evap and condenser. exhaust: you can run the stock MK1 dual manifold and down pipe with a simple spacer available from BFI and other suppliers. or you can cut the down pipe and extend it slightly. other option is to run the MK3 manifold and the TT down pipe. or again, you can modify the MK3 down pipe to make it work. there is a noticeable size difference between the two exhaust setups, however i could not find anyone who's actually done a dyno test between the two to confirm any HP advantages of running one over the other. fuel lines: a couple of ways to go about the fuel lines. option one is to retain their stock location and filter and simply run either a line in front of the motor back over to the fuel inlet on the aba motor, or another variation of this is to run them up into the rain tray and then back over to the fuel inlet on the motor. i do not recommend or advise running them back along the firewall at all. now before you go on about how the OEM hard lines do this, remember they are 1) hard lines, and 2) routed and somewhat protected from the exhaust. another option is to simply rent/borrow a flare tool and simply cut the lines and bend them up on the passenger's side then flaring the ends. there are benefits to doing it this way, however, just remember you need to add a fuel filter in there somewhere. 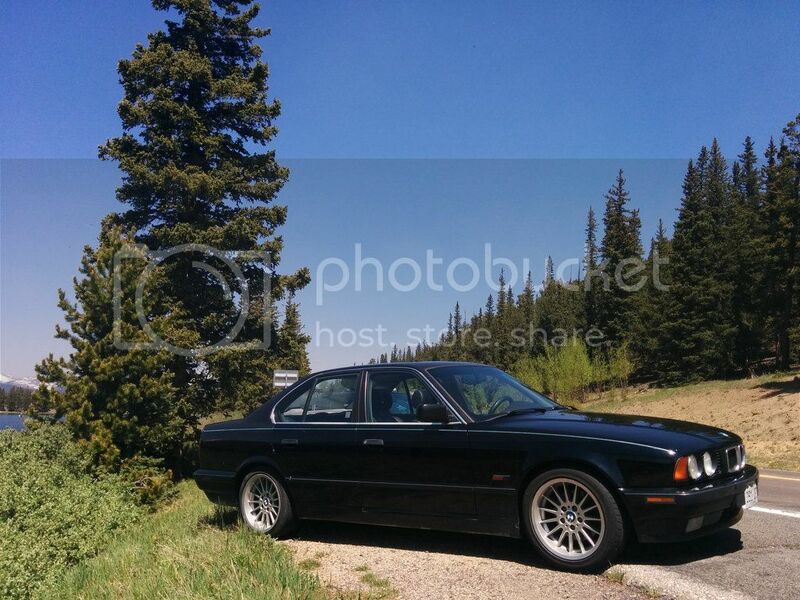 the OEM MK3 one will work and is easily ran inline. the only downside is if you ever decide to sell the car and want to keep the swap and re-install an original 8v you have to address your fuel reroute that you performed for the aba motor. fuel pump(s):your stock CIS fuel pump is just fine to run as is with an aba. you can run it with or without the accumulator. if you're doing the aba swap on a later cabrio or rocco (late 84 and later) the two pumps that are stock to the system are also fine to run. earlier fuel systems required a higher psi to run and as a result are more than enough psi for the aba (and vr as well). the stock fpr on the aba will easily meter off the excess psi without issue. any transmission, with the exception of the VR trannys, will bolt up to the aba. there are a couple of things you need to keep in mine when doing this however. if you plan on keeping the transmission that was stock to the A1/MK1 you have nothing to modify. simply use the clutch/pressure plate/flywheel that is stock for the MK1 motor. now if you are using my wiring trick or making the entire car CE2 you can use the MK3 starter with a MK1 trans, it has a different plug in for the solenoid. if you want to use the ABA trans there is a couple of things you have to do. you have to swap over all the linkage assemblies from the A1/MK1 trans first and foremost. next issue is the axles. the aba trans uses 100mm whereas your stock axles are only 90mm* (*if you are an 85 and later rocco or cabriolet you have 100mm axles and can simply bolt and go). there are a couple of solutions to this issue. first would be to simply swap the transmission flanges from the MK1/A1 trans to the aba trans. this would allow you to simply use the MK1 stock axles in your car already. however iirc the only transmission years with flanges that will swap is from 83/84. early MK1 transmissions have flanges that will not work with the aba transmission. if you don't want to swap flanges and have access to the 100mm axles off the MK3 you can swap the inner CV's. however the 100mm axles are thicker than the splines are long on the stock axle assembly. to get around this you can simply, and carefully, grind down the inner section of the 100mm CV to get it to fit correctly and attach the circlip. downside to this is when you need axles in the future you'd have to buy two axles to just make one. and finally the third option for an axle fix is to run the rocco or later model cabriolet hubs which use the 100mm axles (85 and up iirc). i have heard of people using the rocco/cabriolet axles and grinding down parts of the outter CV's or the hub assemblies to allow the axles to fit as well. you have three options to wire this up. four if you count standalone systems like megasquirt. option 1 is making the entire car CE2. this involves pulling all the wiring from the donor car and swapping it over. this is a very straightforward operation, just very time consuming. the wiring for the headlights, wipers, and ignition are all the same color and easily changed over. the rear lights and climate control are different colors and whereas you can simply use a test light to figure out the rear lights you will need a wiring diagram for the fuel pump/sending unit and the climate control. pin G1/9 - track 36 - T68/3 - 0.5 ge/sw Check engine light - MUST have small bulb inline!! All of these seemed to ground in two main wires, isn't hard to see them when the covering is opened up. Double check your ground connections with the sensors and pins they are supposed to be grounding. Use an ohm meter!! connect pin G1/3 - 0.5 ge/bl to negative side of coil. This activates the stock fuel pump relay. I didn't try too hard to figure out a priming circuit but it starts exactly like a bone stock Mk3, even with the fuel accumulator out. 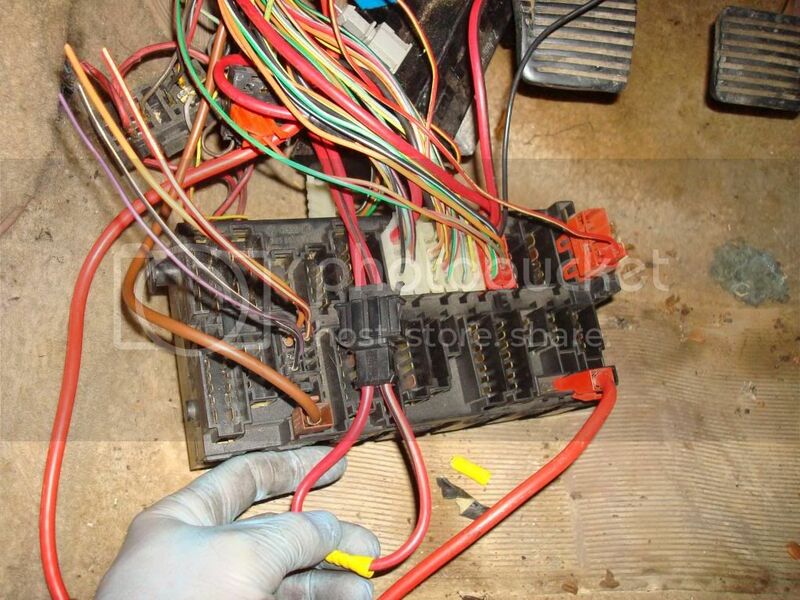 cut the alternator connections out of the harness and splice them to the car side. Should be a small 0.5 blue and a large red wire. This turns on the alternator and will use the light in the early cars dash. I am using a fan relay, radiator fan and switch out of a late Mk1 cabrio. 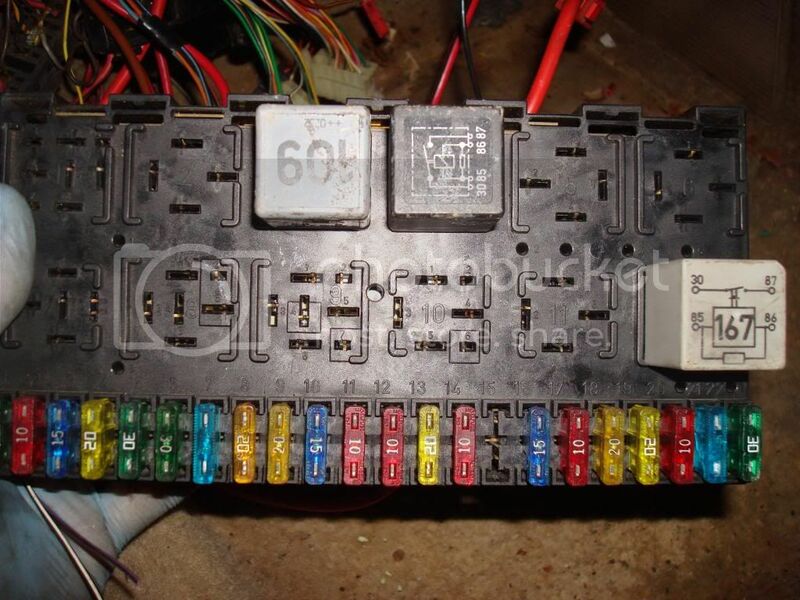 It is wired independent of the ECU and uses the factory power but my application isn't using the relay in the trucks fuse panel. The cabby harness has a relay, two speeds and an input for A/C activation. I haven't put A/C in yet but this will be a nice feature of this harness when I do. I am also using all the emissions stuff in my truck. I am taking vacuum from throttle body like stock and it goes to the N80 and LDP. The vent from the gas take goes up and tees into both of those and I incorporated the stock charcoal canister in the wheel well. I can get better pictures if you want. I just wanted my car to pass readiness and have a CEL on the dash. I used two 40 amp relays powered from the positive side of the coil to activate all the switched powers. It was the easiest way I could think of doing it. I don't have a vehicle speed sensor setup yet and it turns on my check engine light. I am thinking my solution is going to be pulling one of my axle flanges and welding a tone ring to it and use an engine speed sensor (3 wire) on a bracket to get a signal. The car runs great without it and is pretty strong so I don't believe it uses any of the info to run, the ECU just wants to see it. Lots of wiring!! I had some spare wires and connectors in the harness and I just ended up taping it all up. I might need them someday but not today. Plus I didn't want to unwrap the entire harness to weed them out. I cut out all the fan wiring and headlight wiring out of the engine harness, that probably took the most amount of time and concentration. I don't have a tachometer yet. Still working on this one but I have been driving my '78 rabbit for years without one and it doesn't bother me too much. I didn't use the instrument cluster cts for mine. I got it all buttoned up before I realized it (rabbit doesn't have one of those either). You should be able to use the Mk3 one but I just grabbed a Mk2 black sensor in place of the white A/C switch in the side head coolant flange. I grounded one pin to the head and hooked car side up to the other. Works like a charm! Do it how you want. This isn't a DIY and it might not be complete (it's dark and cold outside so I am not going to double check, but can later). If you even attempt this, be familiar with a DVOM, it will hopefully save you from cutting the wrong thing!! 68/51 = Lilac & White - ??? there are a couple of other write ups out there in the MK2 forum which are similar to ours, however this was done on a MK1/ABA specifically so hence why i put it up. Here is the list I have been making of the wires I think are going to need to be spliced to run and have functions like warning lights etc. Please feel free to point out screw ups so I can correct for myself and others thinking of doing this swap and splicing in the obd1 ecu. 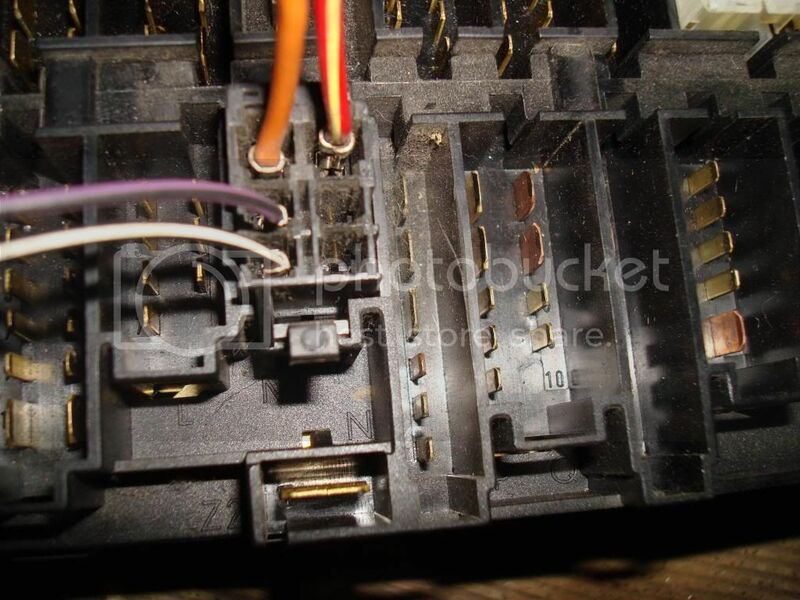 Please note this is for 83-84 jetta / cabbys with ce1 fuse box's!! Power supply relay, 109 is spliced outside of the fuse box as no relay spots available will physically accept the needed one. Chk. eng. light, Is what normally is the oxy elpsd odmtr light, by pass the odmtr part by hooking up to the blu/gry wir that goes direct to the light. Turn Signal Note: For the turn signal indicator light, i did not use the factory wiring. i pulled the MFA wire and repinned the connector to U2/6, flasher relay output, which i connected to the turn indicator lamp. I did this to avoid having to use diodes to prevent the current from bleeding to the other turn signal indicators. Note: Positive power for the mk1 cluster was attained from repinning to the U2/01 plug which is start/run power. option 3 is my wiring trick...aka "piggy back the box" you will need a good bit of the wiring from the donor to make this happen. you power up the CE2 fuse block to run just the motor, it takes five wires to accomplish. you tap into the black power wire off the ignition, the starter wire off the ignition, and the wires for the fuel pump. the downside to this trick is you will have an additional fuse block to fit up under the dash. pin#2 red w/yellow goes to power wire from fuel pump (usually black w/green). picture of the CE2 connector that you piggy back into. in this picture you can see the red w/black stripe starter wire that i connected to the starter wire off the ignition which is also red w/black stripe. also pictured is the black wire that i connected into the black wire off the ignition. picture of the plug for the fuel pump. the two larger wires are power and ground for the fuel pump, the two smaller are for the fuel sending unit. 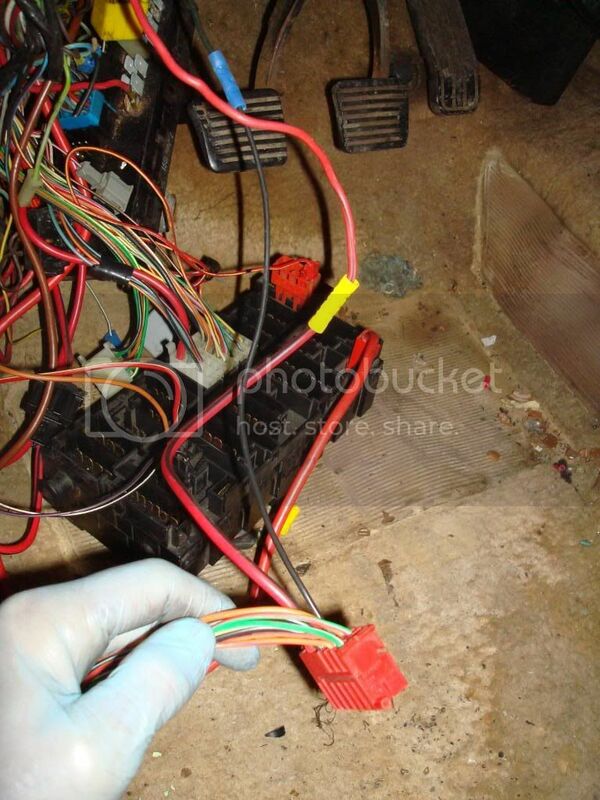 the easiest way to run down your fuel pump wiring is to see what colors are at the pump and fuel level sender then find the corresponding wires up under your dash from the rear loom. earlier MK1's use a chassis ground for the fuel pump so it's only necessary to wire up the power wire to get the pump to work. now if you want to use the MK1 cluster you don't need to touch the fuel level sender wiring. however if you want to use the MK3 cluster you need to wire in the fuel level sender. the coolant temp and oil pressure sensor have to be wired in as well if you are not using the MK3 cluster. you can either go the aftermarket route and use a separate coolant temp gauge and oil pressure gauge...or you can tap into the MK3 wiring via the loom for the cluster (easily identified by the two blue plugs and almost always completely white wiring) and connect that with the MK1 wiring off the stock cluster. plug C pin #12 is the oil pressure sender wire. now you have everything necessary to make the aba run and give you proper feed back without having to run a MK3 cluster or aftermarket gauges. now there are two oil pressure switches. i personally chose the low pressure switch in my application. however you can wire up your high pressure switch if you want to located at the oil filter assembly. a picture of the three relays needed to make the motor run. i just left all the fuses in for the time being. seems i left a few things out about how to make this work. and lastly you can replace the chip with a TT performance chip and this will also solve the issue. however like i said you won't know if you have a problem until after you get your swap running. that's pretty much the whole swap info. Last edited by A1steaksauce; 12-02-2014 at 09:28 PM. Power steering belt w/ AC delete is a 1/2" x 28" v-belt. None of my FLAPS carried that size, but Ace Hardware came through. I ran a p/s pulley on my waterpump for years then got an aluminum INA vr waterpump one .they are the same diameter only the pully offset is a lil off. I didn't know you couldn't use ABA air conditioning... this saddens me. I kept my lines on the drivers side and got a bunch of fuel injection hose to run to the rail. I did this this way because I was in a rush when I installed MegaSquirt. Looking back I realized it probably would have been easier to just spend a little extra time to bend/cut/flare the lines over to the passenger side, so I plan on moving the lines over to the passenger side this spring. I attempted to put it in a cabriolet on one swap and found it to be hitting the front clip assembly to the point of not allowing me to bolt the motor in. if he ran it he probably had to clearance for it...or the cabriolet is that much different under the hood. were they secure with the high pressure from the cis pump? With the proper fuel injection hose clamps, they have held up just fine. Got the clamps at harbor freight too. The most important thing to do is to make sure you use fuel injection hose rather than regular fuel hose. 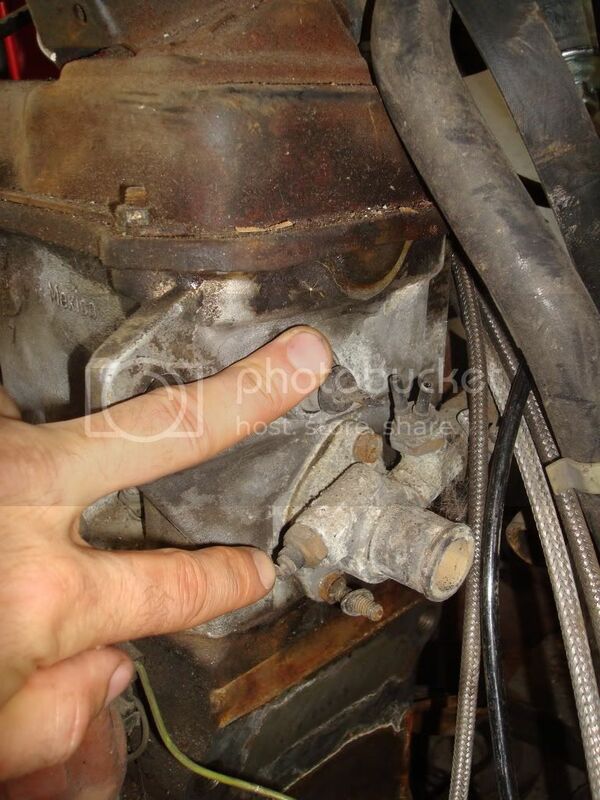 The fuel injection hose is needed for the greater pressure. The mk1 self-adjusting clutch cable is the one to use, even with a mk3 trans, correct? any MK1 clutch cable will work, regardless of the trans.